As part of an ongoing series, we ask some of our Faculty of Education professors and alumni to tell us what they’re doing during the summer (spoiler alert: they’re keeping busy). Read Part One and Part Two. 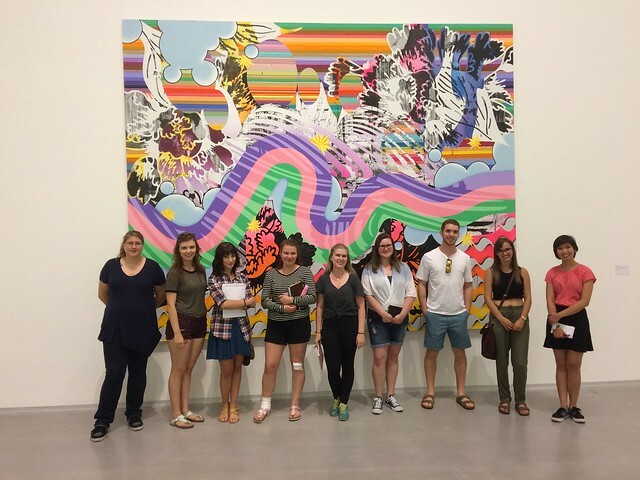 For three weeks in August, a group of undergraduate students and I explored the storied city of Berlin for a particularly unique and curious learning experience as part of the University of Alberta’s e3 Program. We studied the city through comics and graphic novels. We also explored the city itself—its interweaving layers of history and memory, social and artistic spaces, graves and memorials, biergartens and Turkish markets, graffiti and remnants of the Berlin Wall, döner and currywurst. Reading about the city in comics form, and using the social dynamics of comics-reading to illustrate the work that a reader does to make a story out of the gaps between the panels, I also asked the students to listen closely and respond to the city’s various echoes and reverberations. Though not a comic, one foundational text we read was Franz Hessel’s 1929 book, Walking in Berlin, a literary take on flâneurie, where intentional acts of wandering and lingering through the city allow the artist to compose a diary of extraordinary, yet also totally ordinary, observations. Following Hessel’s chapter on the Landwehr Canal, we strolled through the Maybachufer Turkish Market, and then peered into the waters that, as Hessel declared, were “once profaned by villains”—the very waters where communist Rosa Luxembourg’s murdered body was dumped in 1919, a crime also referenced in Jason Lutes’ graphic novel Berlin: City of Stones. After reading selections from Mawil’s Kinderland, set in the early 1990s in East Berlin, we met the artist in his atelier, located only a few steps from the Prenzlauer Berg location of the comic book store Modern Graphics. 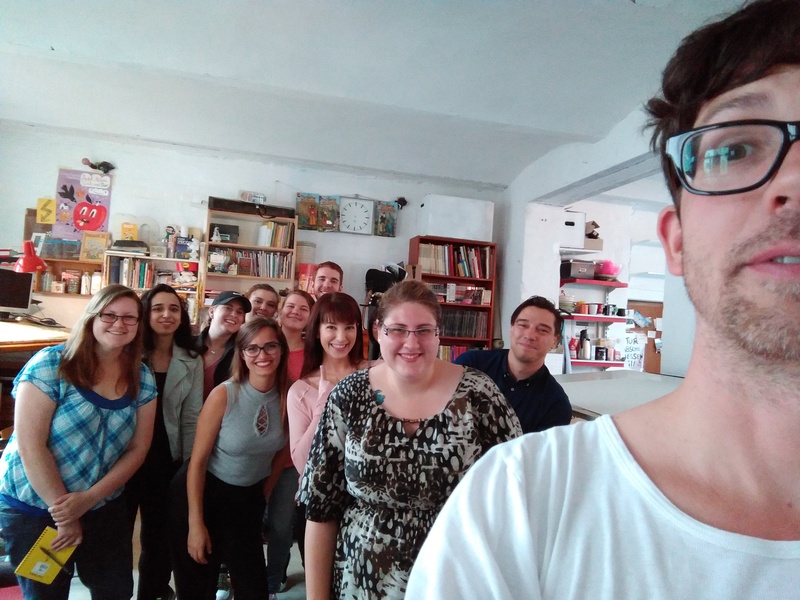 Representatives from Mawil’s publisher, Reprodukt, also met with us to discuss the challenges of translating comics, where words and the montage style of sound effects need to be drawn by hand. The class sits in Weltrestaurant Markthalle beneath the painting illustrated in Tim Dinter’s comic adaptation of Sven Regener’s novel Herr Lehman. We went on a graffiti tour of Kreuzberg, led by a graffiti artist who worked at the youth and subcultural archives of Berlin. Then we visited the Reichstag and saw graffiti left by Russian soldiers after they took the building in 1945. We also took a tour of Comicbibliothek Renate, Berlin’s comic library, with Peter Auge Lorenz, author of Das Land Das et Nicht Gibt. On one of the final days of class, we sat down for schnitzel and roast pork at the Weltrestaurant Markthalle, and discussed Tim Dinter’s comic adaptation of Sven Regener’s novel, Herr Lehmann, set in West Berlin in 1989 just before and during the fall of the Berlin Wall. This restaurant was featured prominently in Dinter’s book and, as we passed through the pages, we noticed that we ourselves were sitting beneath a painting that the novel’s eponymous character also observed. Feeling ourselves a part of the page, I asked my students to consider this: Where are you in the text, and where is text in you? Since we had been pondering the relationship between the city and comics, I asked the students to take the challenges of graphic representation seriously, creating comics and a variety of visual representations that captured their interactions with Berlin. My students may have begun the course as comics readers, though ended as comics writers, following Michael Taussig’s injunction: “A line drawn is important not for what it records so much as what it leads you on to see.” Drawing about the city, the lines of my student’s creations became a way to implicate themselves in all they witnessed. Feature image: Comics artist Mawil snaps a selfie with Education professor David Lewkowich (right) and UAlberta students.